Financial services institutions are high-value targets for cyberattacks because of the capital they control, the personal information on customers they maintain, and the fear an attack on a bank generates in the public. Phishing attacks on FSIs have risen steadily, especially employee credential theft - because once an employee’s credentials are stolen, cyberattackers can access customer information, employee data, even finances. While legacy security solutions claim to block up to 99.9 percent of cyberattacks, all it takes is one employee or contractor to open an email from an unknown source, download a file from a compromised website, or in any other way fall victim to a cyberattack. So, it’s time for a new approach: Isolation, also known as, remote browsing. 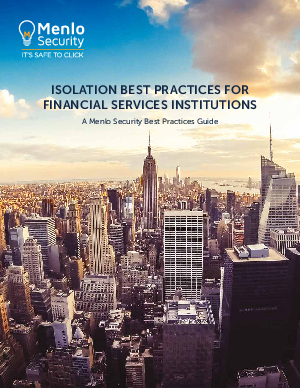 Download this Financial Services Best Practices Guide to Isolation to learn how to best eliminate phishing attacks and web malware.